Planning kitchen lighting can often be an afterthought when designing a kitchen, but with the kitchen one of the primary rooms in the home for entertaining, the right statement or mood lighting can make all the difference to your interior design. For the most part, the best kitchen lighting will complement your interior design as well as provide you with enough light needed to utilise the space in different ways. Consider what look you want to achieve. For contemporary kitchens, MADE has a range of quirky designs to cater to changing trends. If you’re into the current industrial trend, then we particularly like Habitat’s COLEMAN Clear Glass and Copper Ceiling Light, or if you’re looking for something more minimalist, then keep an eye out for LED spotlights which are both modern and bright. We’ve rounded up some of the best kitchen lighting from modern and stylish designs to practical and techy options for the smart home. Complete your kitchen with one of our recommendations below. Industrial chic is the current trend taking over kitchens everywhere, and this pendant kitchen lighting from Habitat offers both style and practicality. It features a long pendant style that can often complement a kitchen island or dining table, and those who have this kitchen lighting recommend using a vintage bulb to really complete the industrial look and feel. Pastels and neutrals often remain on trend and have the ability to complement a wide range of interiors. The latest shade to grace this trend is the soft dusty pink of this retro looking pendant light. It’s simple, yet elegant and you can expect it to provide a bright but warm light to your kitchen that makes it ideal for both cooking and entertaining. If you like to keep things minimal but want to give your kitchen a little edge, then this white ceiling light with contrasting gold-leaf interior is enough to add just a touch of glamour to your kitchen. 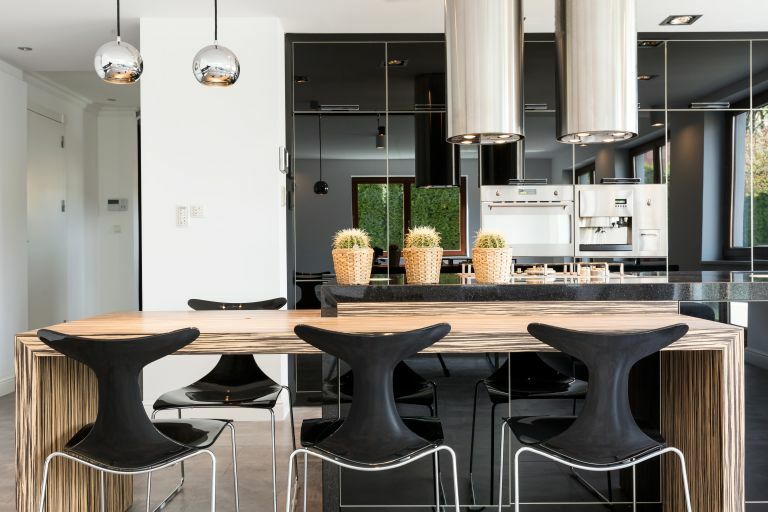 It is not as long as some of the pendant lights, but is said to look equally as good when hung low above a dining table or kitchen island and will provide a warm golden glow. This double pendant light is all about the soft ambient lighting and curved edges that really make it a feature piece for the kitchen. It has a low wattage, so don’t expect to get a lot of brightness from this kitchen lighting, but if you host dinner parties or like to set the mood, you can expect the Faye pendant to really stand out. The Smart Home is a concept that is becoming ever more prevalent, and along with the likes of the Amazon Echo, this Philips Hue light is one of the latest home additions you can buy. The LED spotlight (not replaceable), is contemporary and minimalist, with four light recipes so you can control the mood and brightness. It is compatible with Nest and your smartphone devices, with a whole range of programmable options such as getting your light to flash at your when your dinner is ready. If you’re not too tech savvy this might be a little bit of a tricky concept, but users love it nonetheless. This bulb cluster from made certainly stands out from the crowd. And while it looks pretty quirky, it is also practical for providing a warm but bright light which you can customise to your liking by choosing different sized bulbs to fit the cluster. Whether you want them on the ceiling or hanging above your dining table, it is easily adjustable by an electrician upon installation. If you don’t want anything too flamboyant, then this set of two LED lights might provide the illumination you need whilst keeping your décor as minimal as possible. These are particularly good for ceilings or above the worktops to provide a cool and crisp atmosphere with plenty of lamination to see what you’re doing. Particularly popular in modern kitchens, an LED spotlight is easy to install with no risk of you banging your head on a hanging shade. What is it you're planning to shine a light on? See our round-up of the best kitchen tables and creative ideas for kitchen islands that'll make a real statement.